I recently paid a trip to the STYLENANDA store in Hongdae. I've been interested in Stylenanda's cosmetics line for a while now and only just managed to go to the store and see. STYLENANDA started in 2004, selling only clothes. The name STYLENANDA roughly translated means "My Style". It quickly established itself as a favourite brand among women. Since STYLENANDA began, it has won awards from various websites and received the "The Best Fashion/Clothing Award" by Web Award Korea in 2009. In the same year, they launched their own cosmetic line - 3 CONCEPT EYES. Current models for STYLENANDA include Park Sora and Kwon Su Jeong. 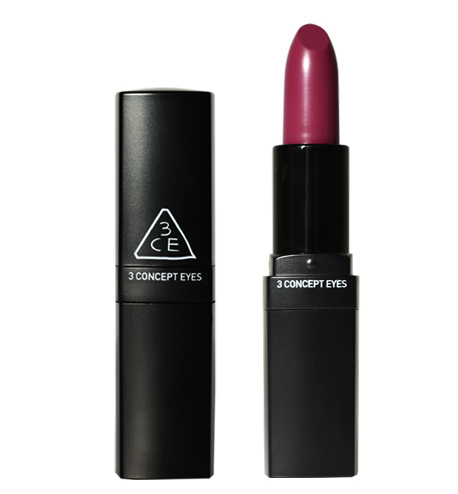 I've purchased a number of things from the 3 CONCEPT EYES line, but I'll review the other items at a later date. Before I went to their Flagship store in Hongdae, I had a look at their website for what items I wanted to purchase. The one item that caught my eye immediately was the Lip Color #501 Bella. Bella extremely different from any other lipstick offered by STYLENANDA. Description on the site: "This Vampire Burgundy Color transforms dull makeup into a unique and chic makeup." This lipstick certainly is vampire-esque. It follows the vamp-lip trend that has been really popular in the last year or so in terms of winter colours. The colour of the stick may be off putting, but as a rule with any lipstick - never judge a lipstick by the colour of the stick! More often than not, a lipstick will look different on your lips as opposed to the stick and even the swatch on your hand. I have a yellow undertone to my skin that's quite noticeable. Hence, I can't wear many pink or peach lipsticks well. In fact, any bright colours don't suit my skin tone well. I find that wearing darker lipsticks more favourable and to look better on me than a pale lipstick. in fact, the lightest lipstick that I wear on a regular basis is my Chanel Coco Rouge in 05 Mademoiselle. I like to apply this lipstick with a lip brush. I feel like with any darker coloured lipstick, using a lip brush is a must. Not only does it spread the colour more evenly on your lips, but it can help you achieve a more defined lip and make your makeup look more polished. After applying an initial layer, if I want it to be more pigmented, I'll apply the lipstick straight onto my lips in small strokes and then use the lip brush again to spread it more. 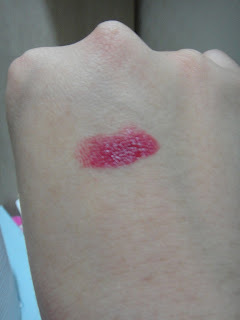 The lipstick itself is creamy and it's fine if you just want to apply straight onto your lips. The finish is slightly glossy but it dries fairly quickly to an almost matte texture. This also means that the lipstick can feel a bit drying, It has no sparkles or shimmer of any sort, so it doesn't define how dry your lips would like a shimmery lipstick would. There's an easy solution of just wearing lip balm before or after applying. After eating and drinking, this lipstick leaves a lovely burgundy stain on your lips. 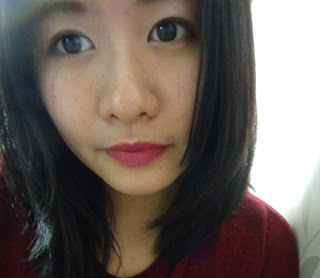 So while the initial effect is gone, you're left with stained lips and it looks very nice. This lipstick is a lipstick that I like to wear when I want a bold lip look. It doesn't look overdone - like some bright lipsticks can look. I wear this on a semi-regular basis. There aren't a lot of bad things to say about this lipstick overall. I would definitely buy it again when I run out! In Korea, there is the STYLENANDA flagship store in Hongdae and the makeup counter in the Myeongdong Young Plaza. However, in order to obtain in if you live overseas, then you can buy it from the STYLENANDA website. They ship worldwide for a small fee.